The Very Large Telescope (VLT) at Cerro Paranal is ESO's premier site for observations in the visible and infrared. All four unit telescopes of 8.2m diameter are individually in operation with the instruments listed below. Two telescopes for imaging surveys are also under construction for Paranal, the VLT Survey Telescope (VST, 2.6m) for the visible, and the Visible and Infrared Survey Telescope for Astronomy (VISTA, 4m). Please check the Latest News from Paranal Observatory and the Latest News on ESO Instrumentation. Ten of ultimately eleven first generation instruments are in operation at the VLT. They are offered each semester through a Call for observing proposals and are operated by Paranal Science Operations. The remaining instrument, HAWK-I, will be installed later in 2007. We give an overview of their global observing capabilities, together with a short description of the VLT's observational strategy. 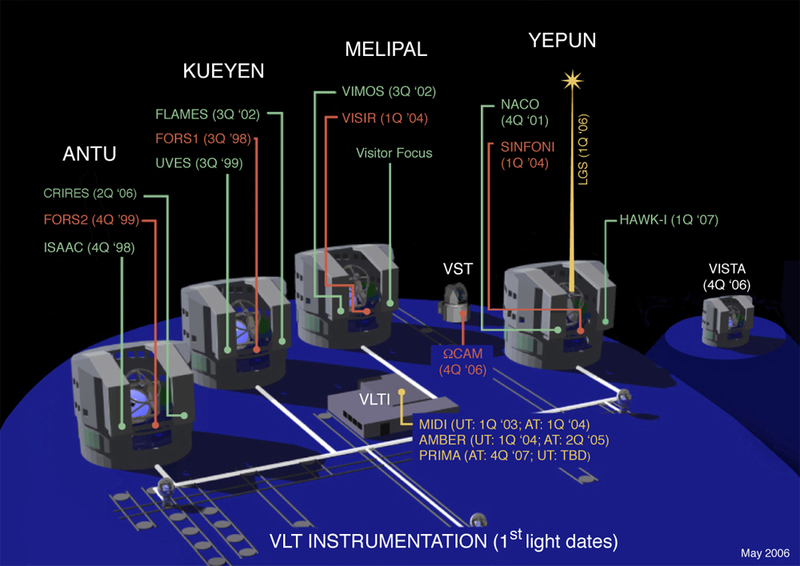 The final instrument distribution among the four VLT Unit Telescopes is shown in the clickable map and table below, which also contain links to VLTI, VST & VISTA instruments. Instruments or facilities still under construction or commissioning are indicated in italics. Apart from these "Facility Instruments" which are available to the whole community ESO offers the possibility to instrument teams to build instruments for their own use, highly specialised towards the well defined scientific goals of the team. See the dedicated page for this Visitor Focus. The VST and VISTA will both be equipped with imaging cameras, OmegaCAM for the visible at the VST and an IR camera for VISTA. Paranal is operating an All Sky Monitor called MASCOT. Although no real-time images are (yet) available, images (taken every three minutes) can be retrieved from the Science Archive.